PICK THIS BOOK UP NOW. First of all, the print copy is gorgeous. It's the perfect size for carrying with you. The jacket design is modern, mysterious and perfectly sums up the contents. It's great for quarter-life crisis meditation. Of course it's Murakami, so this NYT observation applies. I flew through the pages at an incredible pace. The aphorisms are not as quotable, there's more a pervasive feeling of sadness. Go into the book feeling good about yourself, for sure, 'cause Murakami books can be depressive. 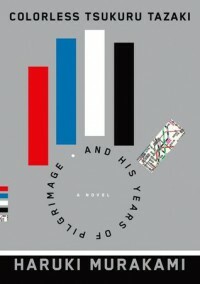 People who've been shy about starting to read Murakami might like to start with this book since its central problem deals with a group of 5 high school friends and then branches out into the philosophy and psychology of growing apart and becoming someone different because of events that are outside of your control. Really, it's a meditation on how forces in the world can make you become a different person, despite what you want and despite what you're growing towards.